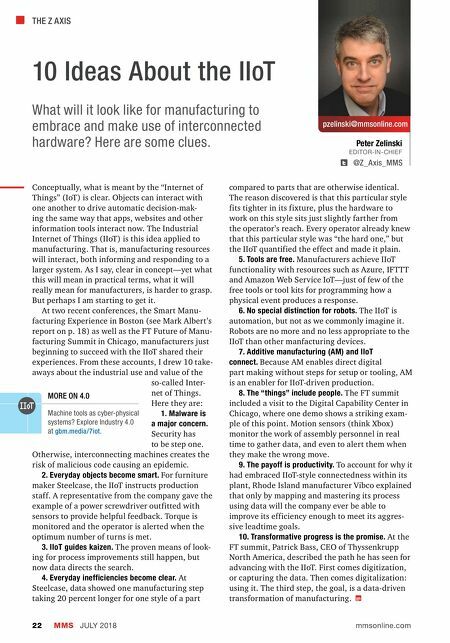 THE Z AXIS MMS JULY 2018 22 mmsonline.com pzelinski@mmsonline.com Peter Zelinski EDITOR-IN-CHIEF @Z_Axis_MMS 10 Ideas About the IIoT compared to parts that are otherwise identical. The reason discovered is that this particular style fits tighter in its fixture, plus the hardware to work on this style sits just slightly farther from the operator's reach. Every operator already knew that this particular style was "the hard one," but the IIoT quantified the effect and made it plain. 5. Tools are free. Manufacturers achieve IIoT functionality with resources such as Azure, IFTTT and Amazon Web Service IoT—just of few of the free tools or tool kits for programming how a physical event produces a response. 6. No special distinction for robots. The IIoT is automation, but not as we commonly imagine it. Robots are no more and no less appropriate to the IIoT than other manfacturing devices. 7. 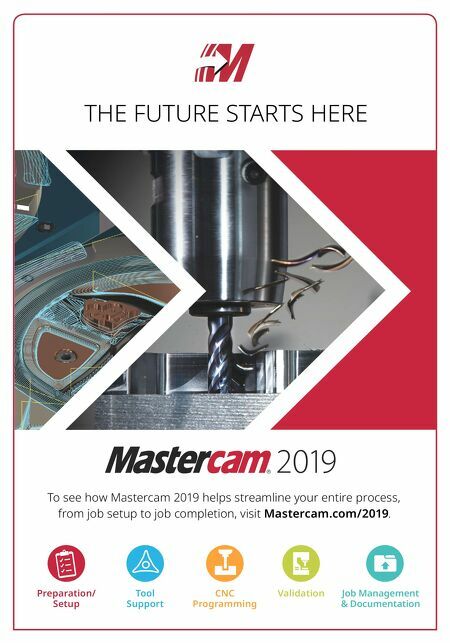 Additive manufacturing (AM) and IIoT connect. Because AM enables direct digital part making without steps for setup or tooling, AM is an enabler for IIoT-driven production. 8. The "things" include people. The FT summit included a visit to the Digital Capability Center in Chicago, where one demo shows a striking exam- ple of this point. Motion sensors (think Xbox) monitor the work of assembly personnel in real time to gather data, and even to alert them when they make the wrong move. 9. The payoff is productivity. To account for why it had embraced IIoT-style connectedness within its plant, Rhode Island manufacturer Vibco explained that only by mapping and mastering its process using data will the company ever be able to improve its efficiency enough to meet its aggres- sive leadtime goals. 10. Transformative progress is the promise. At the FT summit, Patrick Bass, CEO of Thyssenkrupp North America, described the path he has seen for advancing with the IIoT. First comes digitization, or capturing the data. Then comes digitalization: using it. The third step, the goal, is a data-driven transformation of manufacturing. What will it look like for manufacturing to embrace and make use of interconnected hardware? Here are some clues. Conceptually, what is meant by the "Internet of Things" (IoT) is clear. Objects can interact with one another to drive automatic decision-mak- ing the same way that apps, websites and other information tools interact now. The Industrial Internet of Things (IIoT) is this idea applied to manufacturing. That is, manufacturing resources will interact, both informing and responding to a larger system. As I say, clear in concept—yet what this will mean in practical terms, what it will really mean for manufacturers, is harder to grasp. But perhaps I am starting to get it. At two recent conferences, the Smart Manu- facturing Experience in Boston (see Mark Albert's report on p. 18) as well as the FT Future of Manu- facturing Summit in Chicago, manufacturers just beginning to succeed with the IIoT shared their experiences. From these accounts, I drew 10 take- aways about the industrial use and value of the so-called Inter- net of Things. Here they are: 1. Malware is a major concern. Security has to be step one. Otherwise, interconnecting machines creates the risk of malicious code causing an epidemic. 2. Everyday objects become smart. For furniture maker Steelcase, the IIoT instructs production staff. A representative from the company gave the example of a power screwdriver outfitted with sensors to provide helpful feedback. Torque is monitored and the operator is alerted when the optimum number of turns is met. 3. IIoT guides kaizen. The proven means of look- ing for process improvements still happen, but now data directs the search. 4. Everyday inefficiencies become clear. At Steelcase, data showed one manufacturing step taking 20 percent longer for one style of a part MORE ON 4.0 Machine tools as cyber-physical systems? Explore Industry 4.0 at gbm.media/7iot .